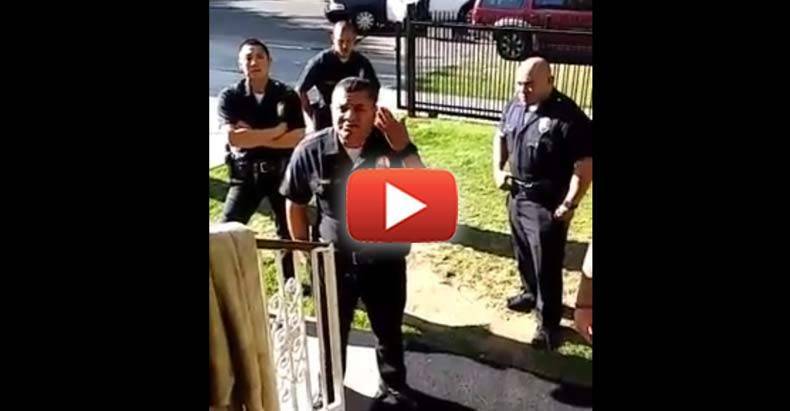 Los Angeles, CA — A video uploaded to Facebook last week shows the ridiculous nature of the American police state. According to the video uploader, the police in the video below came to this house because they saw a teenager riding his bike with no hands and without a helmet. Not wanting to be kidnapped or killed, the teenager rode his bike home after he saw the police. When police showed up, you’d think they were responding to a bank robbery or child kidnapping. However, the half-dozen public servants were only there to extort money from a child for not wearing a helmet. During the standoff, the family knew that their child was going to be kidnapped by police, so they initially refused to hand him over. After several threats, however, the boy would eventually come outside. The officers blatantly lied to the family, saying only that they wanted him to come outside to receive his citation for no helmet. But after walking out, he’s immediately placed in cuffs and put into a patrol car. The video below represents the epitome of everything wrong with police in America today. We see men gunned down, shot in the back by cops over a broken tail light. We see children, murdered by officers who wrongly raided a home in search of an arbitrary substance. The reality is that this boy’s very life was in jeopardy — over a bicycle helmet.